It is illegal to release a grey squirrel back into the wild! A trapping comb will help you with the removal or dispatch of the squirrel. Using one or two combs to persuade the squirrel to move along the trap. The second comb is placed between the first comb and the squirrel as soon as possible. 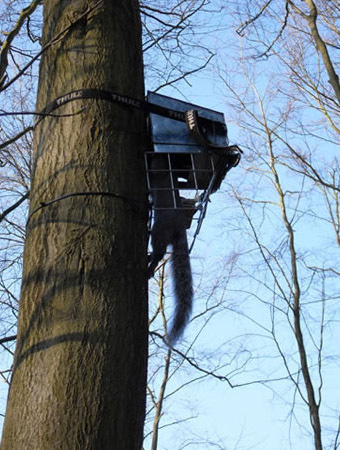 Repeating until the squirrel is held at the far end of the trap. With the squirrel trapped you can easily place the Hessian sack over the end of the trap or dispatch with a gun without the squirrel moving around. Shooting at close range through the trap with an air gun is an equally humane method of dispatch. However, air rifles may be cumbersome to use but some air pistols are powerful enough to achieve an instant kill. There is a risk of injury to the operator as the wire mesh or the ground may deflect the pellet. Blood in the trap may deter other animals from entering and pose a risk of squirrel pox disease transfer where both red and grey squirrels are present. Drowning is not a humane method of dispatch and is illegal. a. Place a hessian sack tightly over the entrance to the trap taking care not to leave any gaps. Roll the length of the sack up to create a tunnel for the animal to move down once released from the trap. Release the door to allow the animal to move from the trap into the sack. The animal can be encouraged to move into the sack by removing the cardboard or plastic cover, by using a trapping comb and/or by blowing gently on the animal’s tail. You can use thick gloves to help minimise the risk of being scratched or bitten. b. Once the squirrel has moved into the sack, use your foot to seal the sack entrance to prevent the animal from escaping, taking care not to step on the animal itself. Roll the sack up behind it to prevent it turning around and manoeuvre the animal into the corner of the sack. Ensure that the head is secure in one corner, not covered by the tail and free of excess sacking. c. When the animal is secured, locate the back of the head and, ensuring it is against a hard surface, using the heavy stick or fishing priest, deliver a rapid blow of sufficient force to fracture the skull. It is the responsibility of the operator to ensure that the method is delivered quickly, effectively and humanely. Death must be confirmed for each animal in all circumstances. Signs of death include: • Loss of rhythmic breathing • Loss of heart rate • Onset of rigor mortis Loss of breathing and heart rate may be difficult to detect if shallow or weak respectively. If there is any doubt about death, a second method must be used to kill the animal. As carrion can play an important part in forest ecosystems it may be acceptable to leave carcasses, distributed in suitable locations in woodland; if on a public site, place out of view. Alternatively, and in garden situations, carcasses may be buried. It is only necessary to disinfect traps if you are trapping in areas where there are red squirrels present. In these cases, using a disinfectant is essential in preventing the spread of disease between grey and red squirrels. If you are unsure as to whether you should disinfect traps or not, please contact your Red Squirrel Officer. Disinfect the trap after it has been occupied. Spray with a solution of disinfectant such as Trigene or Virkon S and leave to dry - the trap can be left out in the rain to rinse away the odour of the disinfectant, which can sometimes discourage animals from entering the trap. Always follow the manufacturers’ safety instructions when using disinfectant.